Disney has created something of a sub-genre for itself with the inspirational sports dramas. They've been doing this in their live action department for some time, but within the past fifteen years or so they have really capitalized on the curbside appeal of a marquee name starring in a "based on a true story" film that chronicles some rather exceptional events that lead to a stirring conclusion audiences can energetically cheer for. Fifteen years on and one might think the mouse house is running short on true life sports stories though as they've now resorted to a movie about chess (not exactly a game that translates to much excitement on film), but it is in these inherent doubts that Queen of Katwe rises above expectations to be a sports movie that not only inspires, but uses the familiar beats of its genre to its advantage rather than allowing them to become a detriment. In not only taking the seeming requirements of such a story in stride director Mira Nair's film becomes more than the sum of its parts by adding a level of maturity and, unfortunately, reality to its story elements that would once upon a time have been Disney-fied so as to gloss over the harsher aspects of the circumstances these real-life characters find themselves in. That Disney doesn't try to mess with The Namesake filmmakers interpretation of Phiona Mutesi's (played here by Madina Nalwanga) story serves it in ways that give it more shadings than something like Million Dollar Arm or Glory Road in which the more conventional approaches resulted in fairly average and conventional films. Don't get me wrong-Queen of Katwe isn't necessarily groundbreaking and certainly isn't life-changing, but it is able to use these tropes we've grown accustomed to in just the right ways meaning they are done in an effective manner. Couple this with the fact Nair has assembled a rather incredible cast that includes Lupita Nyong'o and David Oyelowo supporting newcomer Nalwanga and the other inexperienced child actor's that make up the majority of this authentic cast and the result is not only that of your standard underdog tale in the form of an inspiring sports movie, but an inspiring sports drama that actually has the will and passion to inspire should one come at the movie with their cynicism in check. Robert Katende (David Oyelowo) presents Phiona Mutesi (Madina Nalwanga) with the Queen chess piece signifying her status as champion. It is on the impoverished streets of Katwe, an area in the city of Kampala, Uganda's capital that we meet Phiona who is selling corn with her brother Brian (Martin Kabanza) as instructed by their hard-working mother, Harriet (Nyong'o), who is raising her four children on her own after the death of her husband and one of her other children. The oldest daughter, Night (Taryn Kyaze), has realized she can make a different life for herself by being willing to lean on a man in the way her mother has been too proud to do since the passing of their father. This abandoning of sorts by her older sister leaves Phiona as the oldest of her siblings as her and Brian's youngest brother, Richard (Ivan Jacobo and Nicolas Levesque), can barely speak. Phiona's future looks no brighter than her mother's or her sister's, but it is when the educated Robert Katende (Oyelowo) begins working for a local ministry that serves as a sports outreach program for the slum children of Kampala that things begin to take on a different aura. Katende, despite his many degrees, is hard-pressed to find work, but clearly finds inspiration and purpose in the work he finds with the ministry program that is more rewarding than what he might be offered were he only working for a paycheck. It is when Brian and a few other boys who participate in the sports outreach program request they learn something other than football that Katende brings up the possibility of chess and the advantages it could bring in terms of money as it is a game the richer city boys like to play. 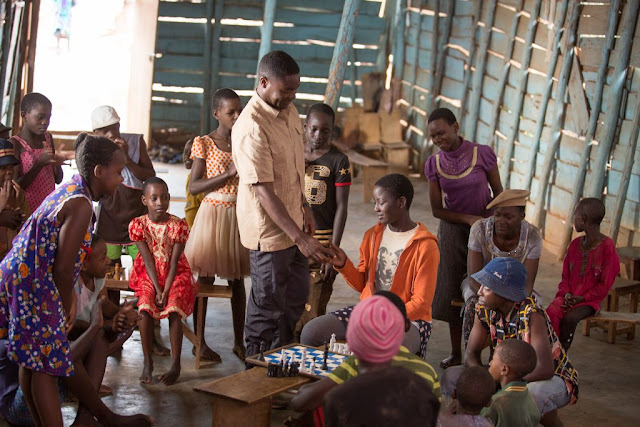 Katende begins teaching the local children the basics of chess, but it is when Phiona shows up with Brian one day that she realizes she may have an accelerated understanding of the game. There are of course the comparisons in playing chess and living life and how the game of chess can teach these young pupils certain values and lessons, but these aspects are never hammered home or presented in a hokey fashion. 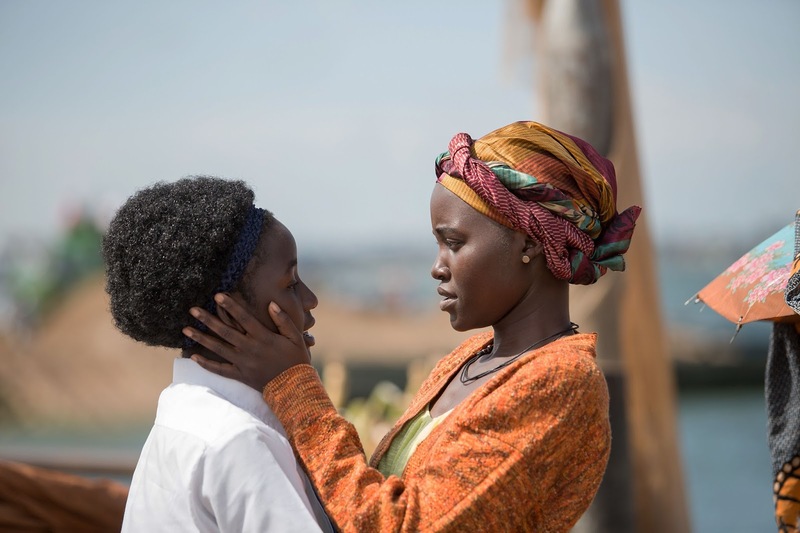 Rather, Queen of Katwe follows Phiona as she is taken under the wing of Katende as he believes she is a true talent with real potential to compete at the professional levels whereas Phiona's mother is worried her new mentor's belief in her will only lead to her daughter's greater disappointment. Of course, given this is a Disney family film it isn't difficult to know that Phiona's journey doesn't end with a destiny unfulfilled, but rather a triumphant return to confidence and a deeper understanding in her skill after a third act battle with self-doubt. That isn't to spoil anything as one can see where things are going the minute they watch the trailer for the film, but it is in the films execution that it, as previously stated, rises above these expected beats to pull off something that simultaneously feels familiar and yet so very genuine. Much of this no doubt having to do with the fact Nair chose to shoot on location in Uganda and other parts of South Africa while also using a mixture of South African and Ugandan youth to fill the various roles in the supporting cast. This type of homegrown approach lends a certain amount of legitimacy to the project and how it appeals to viewers over seeing what we know are actors on a sound stage or false location doubling for the real thing. In her first film, Ugandan native Madina Nalwanga more or less carries a large portion of the weight of this film as she plays our protagonist who sees her world rapidly change after being introduced to a board game with shades she may not even be aware she is playing. By casting a native actress they inherently elicit the details of life in this part of the world that someone from the outside looking in, like many viewers in the western part of the world, might not consider or be able to tap into because of their lack of experience in such environments. By priding Nalwanga's performance on being as natural as possible the actress comes off as seasoned and nuanced and practically anything but inexperienced. Her Phiona is a young girl who is forced to become a woman faster than nature intends given the circumstances of her home life and she is aware enough of the societal conventions informing her gender that she only has a certain amount of time to make something different from her life than that of her sister and so to see Nalwanga play this beautiful arc of a young girl who wholly doubts herself and has essentially accepted the fate she has been given by being born in this region of the world to that of a savior is truly rousing. Of course, the film and Nalwanga's performance are out to show that a person shouldn't be denied the glory of victory because of their birthplace, but rather that sometimes the place we are born into is not the place we belong. Furthermore, that challenges are not necessarily curses. Phiona receives a pep talk from her mother, Harriet (Lupita Nyong'o) prior to participating in a chess tournament. It doesn't hurt that Nalwanga has two pillars as strong as Nyong'o and Oyelowo supporting her. Once again, both of the acclaimed actors give tremendous performances with Nyong'o contributing a mother who must be strong without coming off as stubborn and a woman who is full of pride without coming off as ignorant. Nyong'o is more than capable of conveying such refinement as she is keen on not allowing another man into her life or depending on others to help her survive or raise her children. While essentially at the end of her rope for the entirety of this 124-minute movie Nyong'o plays Harriet with a certain elegance that is cultivated again and again by and through each and every challenge that comes her way whether it be in the form of children who don't listen, eviction notices, or hospital bills. The same could be said for Oyelowo in that he brings a natural gravitas to his performance as the more pedigreed and more established Katende, but that his character is operating within a different set of circumstances lends the actor the difficult task of balancing his intelligence with his humility. It is in the caveats of the film that don't stray away from the fact Katende is spending much of his time and efforts focusing on his pupils causing him to miss a fair amount of time with his wife and newborn child that Queen of Katwe separates itself. By acknowledging that such actions can't be taken without some form of regret or that Katende can't simply take these children to these chess tournaments that introduce them to a different lifestyle and expect them to come back to Kampala and still feel at home in their own lives is where the film heightens the familiar beats. That the film makes a real case for this and doesn't simply gloss over the fact or make a joke out of the kids never having tasted ketchup before (though Benjamin as played by Ethan Nazario Lubega is a really terrific supporting character that brings the necessary comic relief) shows maturity in this Disney product. Maybe the most striking sign of this growth and trust in their audience is a line Phiona speaks to Katende after returning from a pristine tournament in Russia where she didn't do as well as she anticipated. Phiona acknowledges she is getting older, that she is now fourteen, and that, "very soon men will start coming after me." We are struck by the self-awareness of this child who we understand was forced to grow up too fast, but to hear this plead for Katende to help her avoid the same fate as her mother and older sister is not only unexpected, but truly eye-opening. 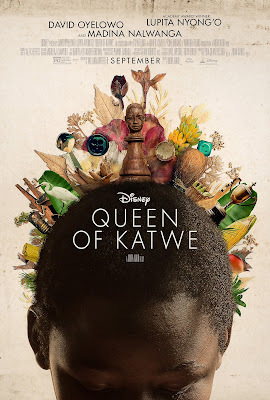 We see Phiona more or less reach a point of no return and as much as Queen of Katwe is a Disney film meant to inspire it's also a film that shows we always have the option of resetting the pieces and starting anew.